The 7th Annual Art Laboe's Summer Love Jam at Agua Caliente Casino Resort Spa | June 30th, 2018 - TheUrbanMusicScene.com | Concerts & Festivals! The 7th Annual Art Laboe Summer Love Jam at Agua Caliente Casino Resort Spa – June 30th, 2018. Featuring Peaches & Herb, Deniece Williams, The Manhattans, Aalon, Lighter Shade of Brown, MC Magic and MORE! 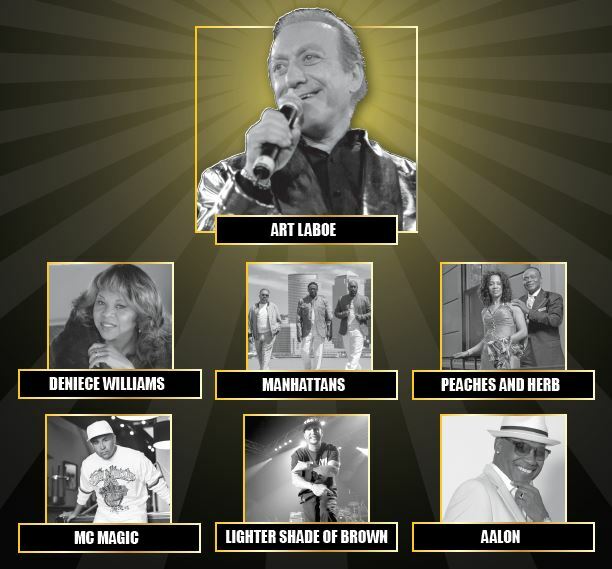 For the seventh year, renowned disc jockey Art Laboe will bring his Summer Love Jam to The Show at Agua Caliente Casino Resort Spa on June 30, 2018 at 7 p.m. Art Laboe’s Summer Love Jam VII will feature Peaches & Herb, Deniece Williams, The Manhattans, Aalon, Lighter Shade of Brown, MC Magic, and a fantastic house band. Art Laboe has been spinning discs as a radio DJ for decades while making historic contribution to the record business. He was the first disc jockey to play rock ‘n’ roll music on the West Coast airwaves, one of the first to play both black and white artists, and had a hand in the first sold out rock ‘n’ roll concert at the Hollywood Bowl. He continues to pack arena concerts today.